A pair of new resins for architectural powder coatings are made to bake at low temperatures and cure quickly. DSM Coating Resins (Zwolle, Netherlands) has released two new additions to its Uralac line of resins: Uralac EasyCure P 3223 and P 3228. Both are dry blend polyesters designed for use in matte architectural applications. 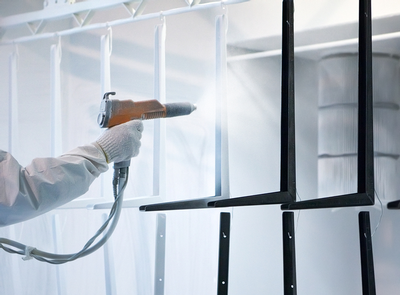 DSM notes that low-bake, fast-curing powder coatings often exhibit issues with appearance, which the company says its new EasyCure resins are designed to address. DSM also touts the resins’ outdoor durability and resistance to blooming. DSM Coating Resins has released two new additions to its Uralac line of resins: Uralac EasyCure P 3223 and P 3228. According to the manufacturer, the new low-bake resins provide a coating with similar properties to one cured at temperatures 20 degrees higher. In addition to saving time, the company notes that coatings with faster cure times, and therefore less time in the oven, will have a smaller carbon footprint, as they require less energy to cure. “This new low-, faster temperature technology is the latest in a series of exciting DSM innovations that continue to strengthen the competitiveness, and grow the market, for powder coating solutions,” said Frederk Hjelmqvist, managing director of powder, can and coil coating resins for DSM. DSM is a global manufacturer of resins for use in paints, consumer goods, powder and coil coatings and other applications.